April grew up in Gilbert, Arizona, but has called Queen Creek home for the last several years. She enjoys cosmetology, having fun with her dogs, and spending quality time with her 3 daughters and husband. As you enter our office, April greets you as a friend and makes sure you receive quality dentistry with a short wait. Her experience in the dental industry extends beyond 20 years. 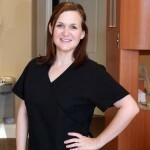 She is always eager to help you with any of your dental needs, such as a last minute appointment, an emergency treatment call, understanding your treatment or insurance plan, and finding ways to afford the care you need. She is an outstanding member of our team. Born and raised in Arizona, Amy completed her four year degree at Northern Arizona University. She now lives in Queen Creek with her husband, son, and 2 daughters. Amy is passionate about brightening teeth because every smile has the ability to spread happiness to others whenever its appears. She loves collaborating with Dr. Hunt to provide gentle, quality dental work in a comfortable environment. By the end of your appointment, you can enter the world again with the confidence and satisfaction a clean smile gives. This friendly smile is contagious. We love having Sierra around to brighten up our days. She grew up in Gilbert and is an Arizona native. She will make you feel right at home in the dental chair. When she isn’t working, she loves to travel and spend time with family and friends. Excellent - painless, courteous staff and no wait time. Recommended! Phil B.
Dr. Hunt and staff are outstanding, make you feel like family and greet you by name as soon as you walk in. Mark and Angelica F.
Great with big people, small children and probably puppies and kittens! Richard L.